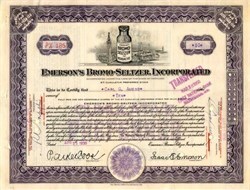 Beautifully engraved certificate from the Emerson's Bromo- Seltzer Incorporated issued in 1930. This historic document was printed by Barton-Gillet Co. and has an ornate border around it with a vignette of the famous Bromo Selzer Building with the Maryland Glass Corporation and other landmarks in the background. This is the view you see in the Baltimore Orioles Baseball Stadium at Camden Yards. This item has the printed signature of the company's founder, Isaac E. Emerson as President and is over 55 years old.